Powers: Bloodwynd is powered by the “Blood Gem” a mythical object created from the Blood of slaves, their sorrow and misery bound together by magic as old as life on earth. The gem can be used as a focus for those of his bloodline to amplify spells and powers. 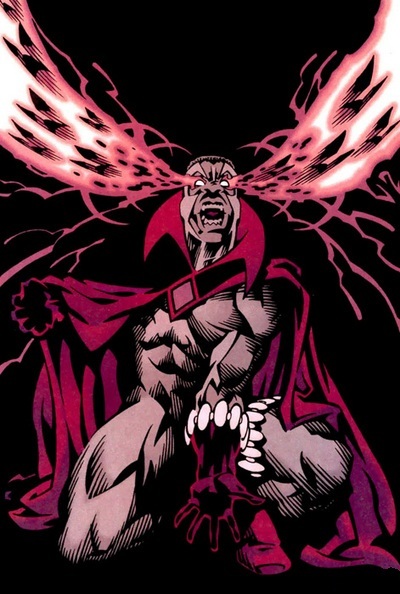 He can also use the gems power to fire concussive force beams from his eyes, teleport, fly, shape shift and summon the spirits of the dead. He can also sense death and places where violent death has occurred. Bloodwynd also possesses the supernatural ability to cause any individual who stares into his eyes to see and feel every bit of physical or emotional pain they have ever inflicted on everyone in their lifetime. Inside the gem is a dimension which contains all the evil contained within him and all past wielders as well as the souls of those killed by the gem. The gem also grows more powerful the longer it exists. Bloodwynd is a descendant of slaves who had created the Bloodgem and passed it down from generation to generation. After he received the gem he was pulled into its alternate dimension where the demon Rott existed. Trapped there Rot took control of Martian Manhunter who joined the Justice League as Bloodwynd. After he was freed he remained with the team for a few adventures and confided the origins of the Bloodgem to them. He later stepped down from active duty when his beliefs conflicted with that of the teams. After day of judgement he was badly injured by demons and served on emergency expansion of the justice League. His current whereabouts are unknown. Perhaps the best black superhero DC ever created. I feel the character had the potential to be an important part of DC continuity and they ruined it with the whole Martian Manhunter thing. I think the editor was asleep on this one. Too bad. Thanks for posting this. I don’t read much DC, other than Batman and had never heard of him before. What issues can I find involving him? Did he have his own series? I’d like to know the same thing. Never heard of this character, but he sounds incredibly interesting. According to Comic Book Database, his first appearance was in Justice League America #61 (April 1992), not Justice League America #76, as stated here. I have not verified which source is correct, though. He also supposedly appears in Showcase ’94 #5 (May 1994) and JLA #27 (March 1999). So far, I’ve found nothing that suggests he ever had his own series. It could be incredibly interesting, though.